Our shimmering heart-shaped tins will bring a loving glow to your wedding reception! Filled with a lightly scented vanilla white wax, each heart-shaped silver metal tin has a removable see-through lid that's the perfect size for our customized labels. The tins measure 2 1/4" by 2 1/4" by 1" tall, which is compact enough to be cute but substantial enough for guests to appreciate. During the checkout process you can select from a vast assortment of background colors and design images, then add 2 lines of custom text such as bride and groom names and wedding date. 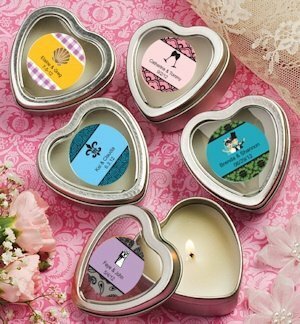 Our heart-shaped tins arrive bulk-packed, with minimal assembly required to adhere the labels to each favor. Note: Dates will match the format of the chosen design, regardless of entry format.Note: For sample orders, you will not be able to specify personalization. Your item will consist of a random representative sample.